While waiting for candlestick confirmation on my AUD/USD short trade idea, I browsed through the comdoll crosses and spotted this long-term forex setup on GBP/NZD. As you can see on the pair’s daily time frame, price has been moving inside a rising trend channel and just bounced off the top of the range. It is currently stalling around the mid-channel area of interest, which happens to be the neckline of the shorter-term double top reversal pattern. 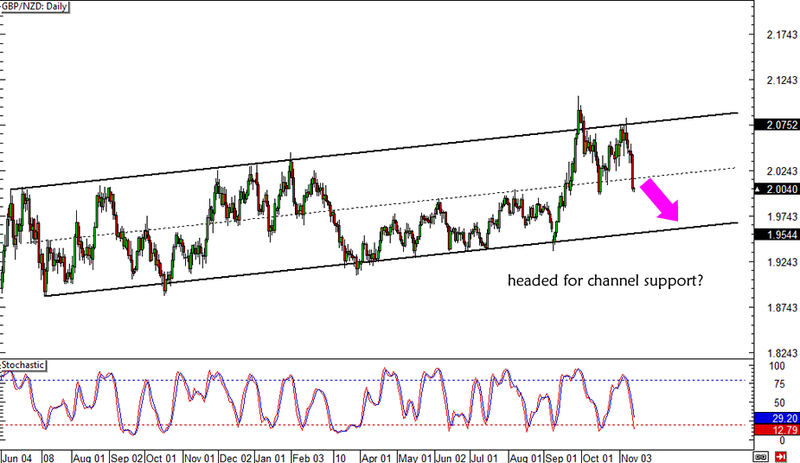 A break below this area or the 2.0000 major psychological handle could lead to a move until the channel support at 1.9600. Recent central bank events suggest a downside bias for this pair, as the BOE Inflation Report confirmed that a rate hike would be delayed while the RBNZ Financial Stability Report led to a Kiwi rally. I haven’t decided on my entry levels yet though, as I’m torn between shorting early at market or waiting for a quick retracement on the shorter-term time frames. What do you suggest?